I am in the process of "becoming frighteningly efficient!" The biggest internal conflict is the belief that if I am too tidy, I will lose my creativity. 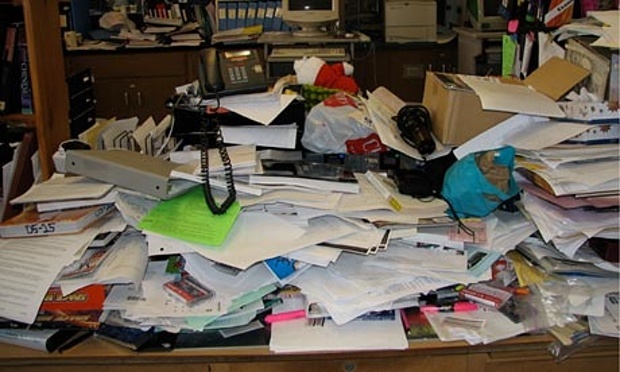 I have been hiding behind the safe saying, untidy desk is the sign of a creative mind... but just recently I have wasted so much time trying to find stuff that should be at my finger tips but has somehow graduated to the bottom of a very big pile of stuff. Am I imagining this or is it really true?? Would you be setting out on an adventure of a tidy desk? What's Up With James Altucher? Refund? What would you do? Is what you do on borrowed time?